Samuel Nicholas wurde am 10. November 1775 vom Kontinentalkongress mit der Aufgabe betraut, zwei Bataillone Marineinfanteristen aufzustellen. Diese wurden Continental Marines genannt. Resolved, That two Battalions of marines be raised, consisting of one Colonel, two Lieutenant Colonels, two Majors, and other officers as usual in other regiments; and that they consist of an equal number of privates with other battalions; that particular care be taken, that no persons be appointed to office, or enlisted into said Battalions, but such as are good seamen, or so acquainted with maritime affairs as to be able to serve to advantage by sea when required; that they be enlisted and commissioned to serve for and during the present war between Great Britain and the colonies, unless dismissed by order of Congress: that they be distinguished by the names of the first and second battalions of American Marines, and that they be considered as part of the number which the continental Army before Boston is ordered to consist of. Ordered, That a copy of the above be transmitted to the General. Die Aufgaben der amerikanischen Marines unterschieden sich nicht sonderlich von Marineinfanteristen anderer Marinen. Sie sollten Schiffe und Besatzung schützen, sowie bei Kämpfen aktiv ins Geschehen eingreifen. Am 28. November 1775 wurde Samuel Nicholas zum Captain ernannt und somit zum ersten Offizier des amerikanischen Marinekorps. Robert Mullan, dessen Mutter Besitzerin der Tun Tavern in Philadelphia war, wurde von Nicholas zum Rekrutierungsbeamten ernannt. 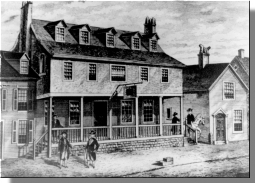 Die Tun Tavern diente bereits seit vielen Jahren als Treffpunkt der von Benjamin Franklin 1756 gegründeten Pennsylvania Militia. Ein weiterer Ort für Rekrutierung war das Gasthaus Conestoga Waggon, welche im Besitz der Familie Nichols war. Unter Alkoholeinfluss konnten dort viele Rekruten, angeworben werden. Bis Dezember konnten fünf Kompanien mit ungefähr 300 Marines ausgehoben werden. Der erste größere Einsatz war die Landung in der Nähe von Nassau um Schiesspulver und Kanonen zu erobern. Vorzeitig gewarnt, konnte jedoch ein großer Teil der Waffen in Sicherheit gebracht werden. Im Dezember 1776 sollten die Marines zu General Washingtons Armee bei Trenton stoßen. Sie erreichten die Schlacht von Trenton nicht mehr rechtzeitig, konnten jedoch in die Schlacht von Princeton eingreifen. Einer der letzten Einsätze der Continental Marines war die Bewachung eines Geldtransports von Boston nach Philadelphia. Das von Louis XVI. geliehene Geld diente zur Gründung der Bank of North America. Mit dem Abschluss des Friedensvertrags von Paris im Jahr 1783 wurden das Marinekorps, etwa 2.000 Mann, so wie die Continental Navy, aufgelöst. Dennoch feiert man noch heute den 10. November als Geburtstag der US Marines. SEC 1. Be it enacted by the Senate and House of Representatives of the United States of America, in Congress assembled, That in addition to the present military establishment, there shall be raised and organized a corps of marines, which shall consist of one major, four captains, sixteen first lieutenants, twelve second lieutenants, forty-eight sergeants, forty-eight corporals, thirty-two drums and fifes, and seven hundred and twenty privates, including the marines who have been enlisted, or are authorized to be raised, for the naval armament, and the said corps may be formed into as many companies, or detachments, as the President of the United States shall direct, with a proper distribution of the commissioned and non-commissioned officers and musicians to each company or detachment. SEC 2. And be it further enacted, That the pay and subsistence of the said officer, privates, and musicians, shall be as follows, to wit; to a major, fifty dollars per month, and four rations per day; to a captain, forty dollars per month, and three rations per day; to a first lieutenant, thirty dollars per month, and three rations per day; to a second lieutenant, twenty-five dollars per month, and two rations per day; and to the non-commissioned officers, privates, and musicians, conformably to the act, entitled "An act providing a naval armament," as shall be fixed by the President of the United States: and the President of the United States shall be, and is hereby, authorized to continue the enlistment of marines, until the said corps shall be complete: and, of himself, to appoint the commissioned officers, whenever, in the recess of the Senate, an appointment shall be necessary. And the enlistments, which shall be made by virtue hereof, may be for the term of three years, subject to be discharged by the President of the United States, or by the ceasing or repeal of the laws providing for the naval armament. And if the marine corps, or any part of it, shall be ordered by the President to do duty on shore, and it shall become necessary to appoint an adjutant, paymaster, quartermaster, sergeant major, quartermaster sergeant, and drum and fife major, or any of them, the major or commandant of the corps is hereby authorized to appoint such staff officer or officers, from the line of subalterns, sergeants, and music, respectively, who shall be entitled, during the time they shall do such duty, to the same extra pay and emoluments which are allowed by law to officers acting in the same capacities in the infantry. SEC 3. And be it further enacted, That detachment of the corps of marines hereby authorized, shall be made in lieu of the respective quotas of marines which have been established or authorized for the frigates, and other armed vessels and galleys, which shall be employed in the service of the United States: and the President of the United States may detach and appoint such of the officers of this marine corps to act on board the frigates, and any of the armed vessels of the United States, respectively, as he shall, from time to time, judge necessary, any thing in the act "providing a naval armament" to the contrary hereof notwithstanding. SEC 4. And be it further enacted, That the officers, non-commissioned officers, privates, and musicians, aforesaid, shall take the same oath, and shall be governed by the same rules and articles of war, as are prescribed for the military establishment of the United States, and by the rules for the regulation of the navy, heretofore, or which shall be, established by law, according to the nature of the service in which they shall be employed, and shall be entitled to the same allowance, in case of wounds or disabilities, according to their respective ranks, as are granted by the act "to ascertain and fix the military establishment of the United States." SEC 5. And be it further enacted, That the non-commissioned officers, musicians, seamen, and marines, who are or shall be enlisted into the service of the United States; and the non-commissioned officers and musicians, who are or shall be enlisted into the army of the United States, shall be, and they are hereby, exempted, during their term of service, from all personal arrests, for any debt or contract. SEC 6. And be it further enacted, That the marine corps, established by this act, shall, at any time, be liable to do duty in the forts and garrisons of the United States, on the seacoast, or any other duty on shore, as the President, at his discretion, shall direct. Etwa 500 Soldaten standen unter dem Kommando von Major William W. Burrows. Es war klar, dass sie ihren Dienst hauptsächlich auf den vier neuen amerikanischen Fregatten versehen sollten. An Bord der USS Constitution erlangten die Marines rund um Hispaniola erste Kampferfahrungen. Bekanntheit erwarb das USMC im ersten amerikanisch-tripolitanischen Krieg (1801-1805). William Eaton und First Lieutenant Presley O'Bannon führten sieben Marines und 300 Söldner an um Tripolis zu erobern. Während des Kriegs von 1812 kämpften die Marines in einigen Seegefechten. Größeren Einfluss hatten sie jedoch in der Schlacht von Bladensburg und der Verteidigung von New Orleans. Im amerikanisch-mexikanischen Krieg (1846-1848) kam das USMC durch die Schlacht um Chapultepec zu Ruhm. Sie erstürmten die über Mexiko-Stadt liegende Festung Chapultepec, was letztendlich zu dem Fall der Stadt führte. Dieses Ereignis, sowie der Angriff auf Tripolis, fanden ihren Weg in die Hymne des USMC: "From the halls of Montezuma To the shores of Tripoli…"
Am 16. März 1861 wurde das Confederate States Marine Corps (CSMC) ausgehoben. Die Aufspaltung des Marine Corps führte dazu, dass es auf keiner Seite der Bürgerkriegsparteien eine große Rolle spielte. Das USMC wurde in der ersten Schlacht am Bull Run fast vollständig aufgerieben, das CSMC erreichte niemals seine Sollstärke.